Adventure still exists in Europe! The Rumanian mountain forrests - and the people living there - greats you welcome in the most fantastic area for endurance driving on off road motorcycles. The terrain offers everything from the flat grass, bush and forrest covered flatlands in the vallyes, up through steep, narrow and curved tracks in the forrests on the mountain sides, to broad and brethtakeing sceeneries on the mountain tops. 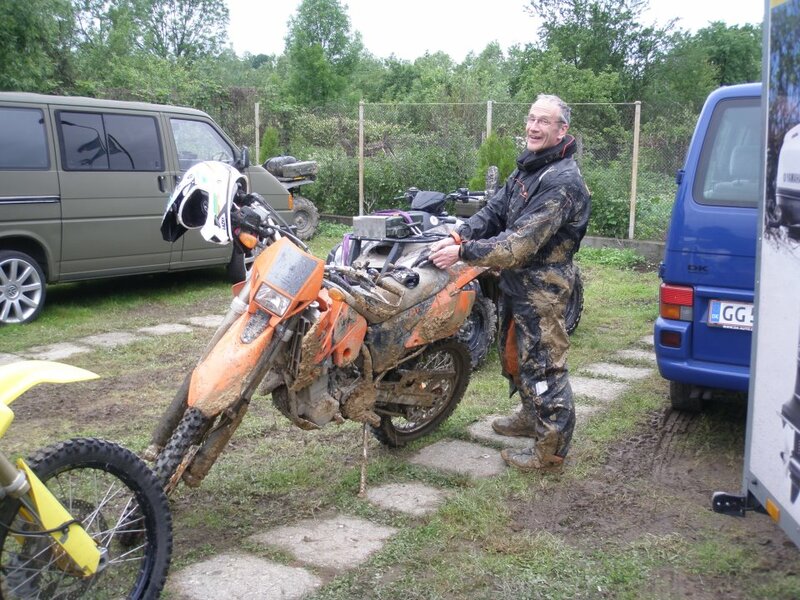 My friend Teis and I had received an invitation to join the Danish enduro entusiast group on their yearly tour to Rumania, where the experienced off-roader Tonny would be guide for enduro beginners. The above images are from this invitation and Teis and I were completely sold. We just had to be part of this! 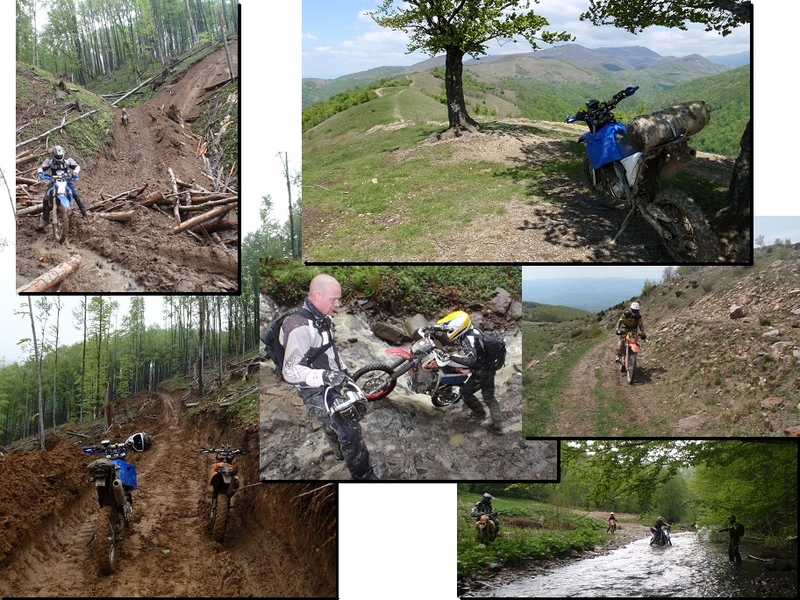 Hence without having any off-road experience, no off-road motorcycles and no off-road gear, we accepted the invitation and started preparations all from scratch. 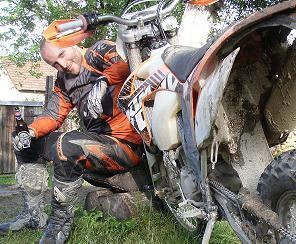 We both needed to purchase a suitable off-road motorcycle and all of the off-road gear needed to ride it safefully. 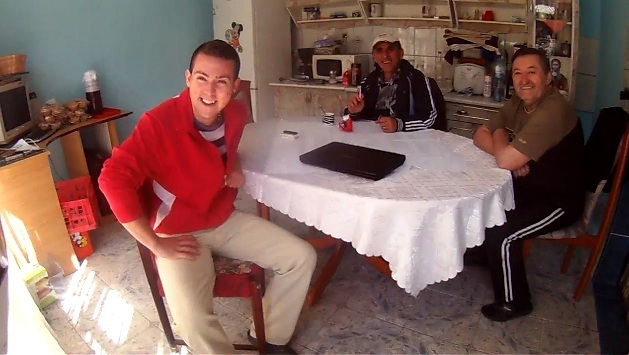 Fortunately Tonny was a goldmine of information and guided us in the right directions. First the bike. It had to be equipped with lights, turn signals and generator with enough power for this, because we shoud be prepared for late evening returns to the base camp. A normal off-road bike used for closed tracks does not have this equipment, so we had to look for the dedicated endurance versions. Tonny further recommended light weight 200-450 ccm bikes as larger engines would mean heawyer bikes more difficult and risky to handle on steep and difficult mountain tracks. 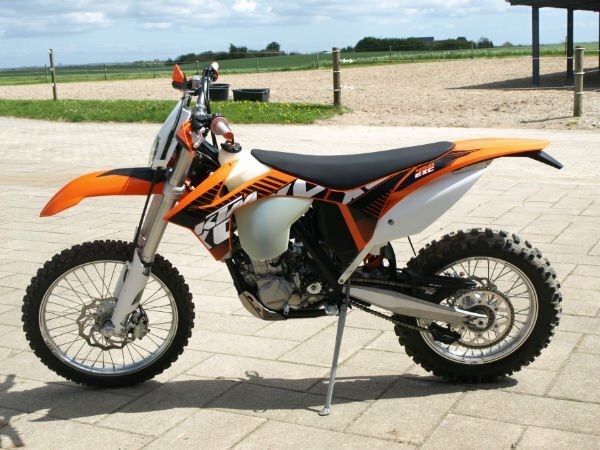 Types like Yamaha WR250 R and KTM 400 EXC would be ideal, but older types like Yamaha XT 600 would also be suitable, although on the heavy side. 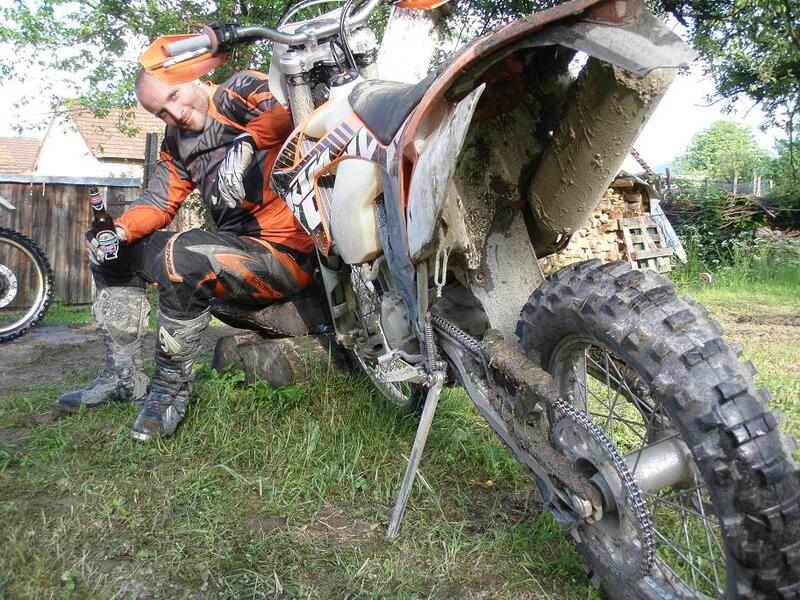 Types like BMW GS 1200 would be "way to heavy" he said. 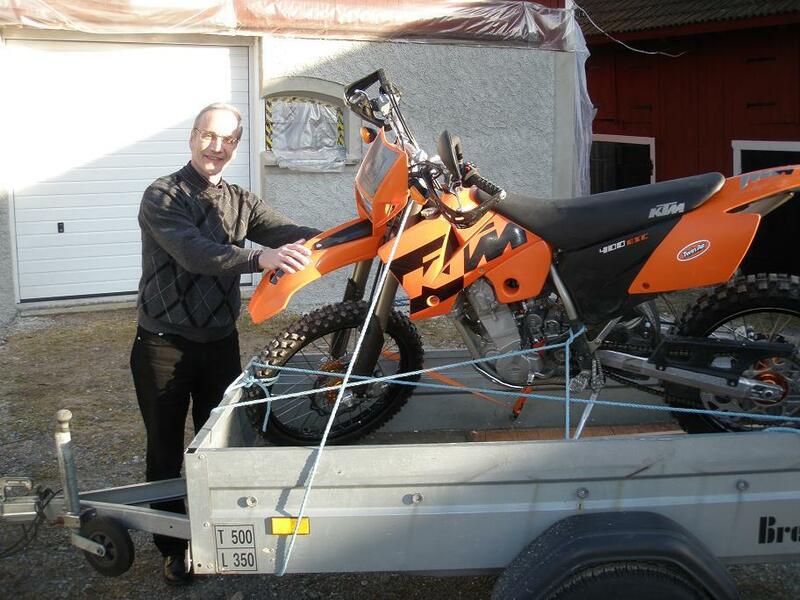 I found my KTM 400 EXC 2004 on the www.blocket.se homepage where it is possible to search on specific models and to limited areas of Sweeden which are not too far from Copenhagen where I live. Endurance bikes are much more common in Sweeden than in Denmark, so it only took me a few weeks to find one which was very well maintained. Buying it in Sweeden had an extra advantage. Sweedish registration and insurance costs is only a small fraction of what it would be in Denmark, so as has no need for using it on public roads in Denmark I did not need a Danish registration. Click to read more (in Danish) about Sweedish Registration. Teis decided to by a brand new KTM 450 EXC from 2012. My new 'baby'. Teis's new 'baby'. In rough terrain it is best to drive with relatively low air pressure (about 1 bar) in the tires, and normal tubes then easily gets squeezed towards the rim and punctures. 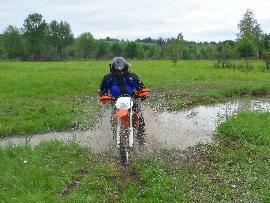 Hence it is a good idea to mount tire mousse. After watching a couple of instruction videos on YouTube we manged to do this ourselves on my bike, and Teis got his brand new bike delivered with mousse in the tires. We got about two hours test drive on flat fields arround the farm belonging to Teis's parents before the trip to Rumania. 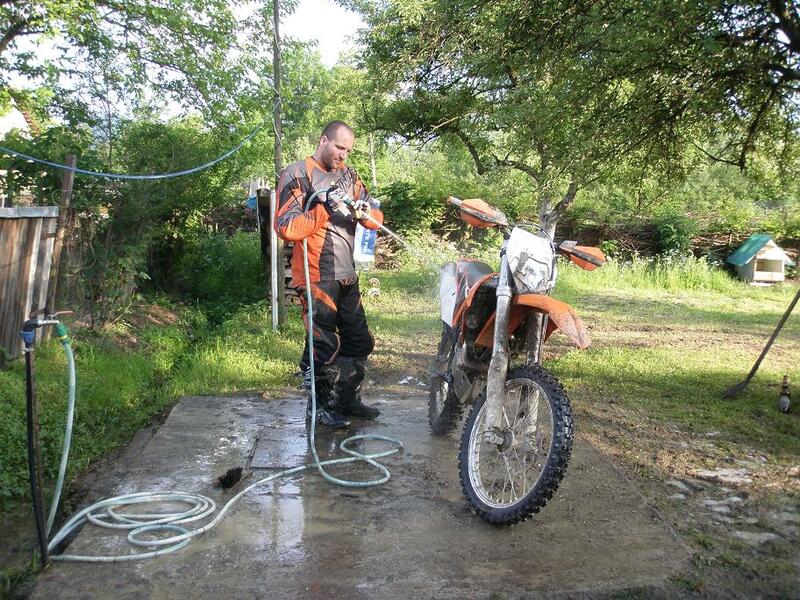 I must admit that I felt somewhat concerned about going on this trip with so little off-road training. In some way we convinced ourselves that our gymnastic background would keep us from falling to hard when things got bad! 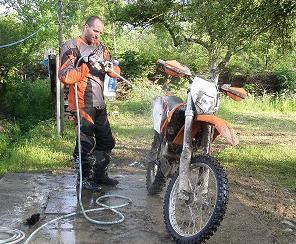 Next task was to purchase all the required off-road gear, such as boots, pants, body-armour, helmet, goggles, gloves, .... 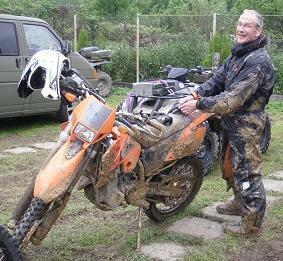 etc., and don't think for a second that you can use your standard motorcycle gear because it will quite simply not be suitable for off-road! I bought most of the gear at NR Service where Jesper gave me excellent advice on what to select. The boots must have a stiff sole so you can stand on the foot rest all day without having the blood supply blocked under your middle foot. They must be tall, water tight and preferable made with quite flexible leather for comfort, because you will be wearing them all day long. The length of the cross pants is designed to fit into the long boots. The light weigt cross helmet with no wind screen ensures good ventilation at low speeds so your goggles are kept dry. The body armour must protect albows, shoulders, back and chest, and must have a perfect fit for your body. The pants and shirt must let wind get through, so you do not overheat when working hard on the bike while climbing. Copenhagen, Denmark to Caransebes, Rumania - 1700 km! 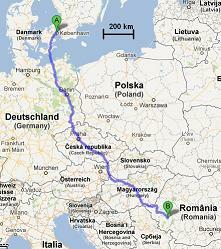 Travel - Route and Vehicles. This article is still under preparation, so if you want to read more, come back again in a couple of days/weeks and see if I have had time to continue writing. The following outlines some of the topics to be included. 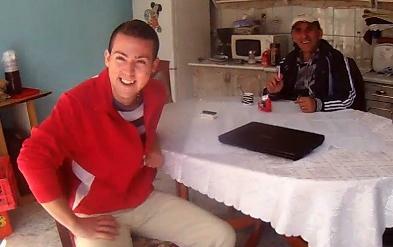 Staying with the wonderfully hospitable Ciric family in Turnu Ruieni. Contact info: Christian Ciric +40 7 2547 8287. Bogdan and his father Mihai Ciric in the 'office'. � Copyright 2012 FireBladerDk 2012-07-07. Last updated 2012-12-28.